We’ve picked out their five best-selling models starting with a smaller lightweight model right up to a commercial grade beast at the top of the range. Then we’ve compared these five so you can see just what each one is capable of and so make an informed choice when you come to buy one. The models we’ve picked out start with the lightweight 130BT, followed by the low-end commercial grade 150BT. Next up we have the mid-range but powerful 350BT and 360BT, finishing with the top end 570BTS for any demanding jobs. All of the last three are full commercial grade blowers. We have also thoroughly researched all of these models online to find out the views and opinions of the people who have bought and used these machines. There’s nothing more important these days than getting the feedback of people just like you, to make sure a product lives up to its name. All these models are gas powered, backpack machines which we recommend for anything above clearing a very small yard. Many people find what used to take them hours of back breaking work with a hand-held blower can be done in an amazingly short time with one of these. They are also very comfortable and easy to use thanks to the ergonomic harnesses and controls plus they can be used for more than just blowing leaves, as we talk about in our article on 7 clever ways to use a leaf blower. First of all though, let’s take a look at the specs and features of all three together so you can see exactly how each one compares. As you can see, feature wise these blowers are very similar and differ mainly only in their power and weight. Let’s just take a look at some of those standard features to see what they mean to you. These engines from Husqvarna have been built to provide optimum power with reduced emissions and increased fuel efficiency. They are all 2-stroke so will require a gas-oil mixture as fuel. Louder than a 4-stroke machine they are more popular for use in leaf blowers as they are lighter, more powerful and cheaper! These engines have also proven very reliable and easy to start for most users looking at the online reviews across every model. All the models should provide you with around 1 to 2 hours run time depending on how you use it which is usually enough to tackle most jobs without stopping to refuel. The backpack on these machines has proven very comfortable to wear for nearly everyone according to our research. They are well balanced and the harness provided for each one has been designed for comfortable, long-term use. The operating handles are adjustable to ensure a secure grip and the throttle is very easy to operate. All the models have some form of cruise control as well so you can take your hand off the throttle once set. We will look at each model separately to see how much power it has, but all these machines have a high CFM and air speed rating compared to other brands so will perform very well in comparison. For reference, check the air flow rating in the pipe (measured in CFM) when comparing machines as this tells us how much air a blower is capable of moving and at what speed. The carburetors on all these models have a system to remove air from the fuel system to make starting easier. This is usually done by pressing a flexible bulb a few times to purge the air, which can be located by checking in the user manual. One of the main causes of operator fatigue, particularly when using a blower for long periods is due to excessive vibration from the engine. This can be felt through the harness and control handles. All of our selected models have dampeners that isolate the engine from the chassis to reduce vibrations to a minimum. Time now to take a look at individual models to find out what each one is capable of and what sort of uses we think it would be best suited to. The 130BT blower is the lightest of our review models and has the lowest airflow rating so it will come as no surprise that it’s the cheapest as well! This model is the one we would recommend for the homeowner that has a smallish piece of land of up to 1 acre and only needs it for occasional use. You can read our full review on the Husqvarna 130BT here, but let’s take a quick look at the all-important statistics to get some idea of what it can do. 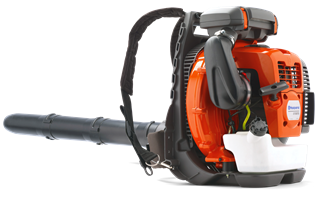 That powerful X-Torq engine design used on all the blowers is a 30cc 1.13hp version on this machine so is more than capable of tackling most jobs around the home and garden. The critical airflow rating is 374cfm and it has an airspeed at the nozzle of an impressive 167mph. Those are great ratings for an entry level gas powered blower. This is also the quietest of our blowers at just 91dB(A) which is below average for a gas-powered blower, but even so, you do still need to wear ear defenders of course. This is a fairly light machine at just under 15lbs without any fuel, so this one is ideal for anyone who prefers a lightweight blower for whatever reason. The next model up is nearly 6lbs heavier although you do get a lot more power with that extra weight. In fact, the 150BT, which is the next one, is not that much more expensive (around $50 more at the time of writing) so if you don’t mind carrying the extra weight, it may well be a better option. Most reviewers are very happy with the 130BT with only a few problems reported, mostly to do with starting the engine. It’s impossible to say what causes starting issues as there are so many factors that could affect it, but luckily this seems to be a problem most people don’t have. 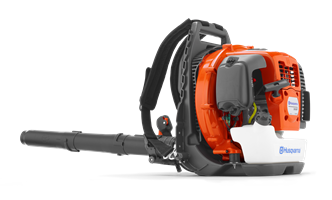 You also benefit from the comfort of a 2-year warranty and excellent service network with Husqvarna leaf blowers so you will be able to get it fixed even if it does develop a reluctance to start. Overall, the 130BT is a great blower and ideally suited to the smaller landowner or someone who needs a lighter model. See our full review here. The next one in our lineup is the 150BT, which is at the top end of the homeowner range although Husqvarna also describe it as an entry level commercial grade one. What is certain though is that this model packs a powerful punch, with a nozzle airspeed almost matching that of our top model, the 570BTS. All that power is courtesy of the 50cc 2.15hp X-Torq engine in this machine which boosts the air flow rating to 434cfm in the pipe and an airspeed of 214mph at the nozzle. The high airspeed is a result of both the increased airspeed at the motor (higher than all our models here) and fitting the included extra nozzle which reduces the diameter of the pipe. See our full review of the 150BT here. That is more than enough blowing power for most jobs that someone with a medium sized yard, say between 1 and 5 acres, would need to tackle. As we mentioned it’s only a little more expensive than the 130BT so is the better buy if you don’t mind the extra weight, which on this model is 22.5lbs without fuel. Noise wise this blower is a few decibels up on the 130BT at 94dB(A), so ear protection definitely needed. You might also notice that the fuel tank is smaller on this model which is odd, although it doesn’t show up as a problem in any reviews so is just something to note. The reviews for this model are very positive with just isolated cases of engine trouble as with the 130BT. Many buyers are very happy with their machine and post glowing reviews which are great to see. We think the Husqvarna 150BT is a blower that will not let you down and can handle most jobs you’re likely to throw at it. It’s pretty much an entry level commercial machine but without the bulk and weight of the top end models so for most people it’s highly recommended. You can find out more about it in our 150BT full review here. The 350BT has been around for a number of years and has been one of the most popular blowers on the market all that time. You can think of this as an upgraded 150BT as it has a similar engine, but as this is a full commercial grade machine it has better vibration damping and a more rugged build. The engine is the same 50cc 2.1hp X-Torq engine as in the 150BT, but with the higher-grade components, it generates an improved 494cfm in the pipe and an airspeed of 180mph. That’s without the smaller nozzle used on the lower model so is much more powerful. It makes the same amount of noise though, with a rating of 94dB(A) and everything else about the 350BT is very similar. Interestingly, at the time of writing, this model is a few dollars cheaper than the 150 model, so it’s well worth checking it out to see if you can get it on a good deal. There is also another variant of the 350BT called the 350BF. The F at the end signifies that the model has the throttle control located on the frame instead of on the tube. Some reviewers of the BT model have commented that it would be nice to have the throttle actually on the backpack for easier starting and with the BF model, that’s exactly what you get. Elsewhere the reviews are pretty good across the board and as the model has been around for a long time, there are quite a few of them. That shows how good the machine is we think as it has stood the test of time. Any negative ones are mostly relating to the usual starting problems we’ve covered in the previous models. We think the 350BT is well worth looking into if you are worried the lesser model may be a little underpowered for the jobs you have in mind. If you can find it on a good deal, then it’s the better one to go for in our opinion. You can find out more in our full Husqvarna 350BT review. 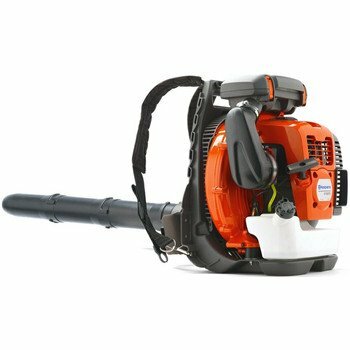 One of the newest models in the commercial range of Husqvarna blowers, this blower has received high praise all round. You can read all about it in our full Husqvarna 360BT review. This model is perhaps the most versatile for both homeowners and professionals alike with a powerful 66cc 3.81hp X-Torq engine that is a big jump up from the previous models. The air flow in the pipe is almost half as much again as well with a rating of 631cfm and although the airspeed seems a bit low at 104mph, it’s more about the huge blowing capacity with this machine. The 360BT is also only slightly heavier than the 350BT, weighing just 23.2lbs without fuel which is amazing considering how much more power it has. Noise levels are up a little as well as you might expect with levels around 97dB(A) at the operator’s ear. As we mentioned above, the reviews for this model are currently top of the class so there are no problems to report as yet. All this extra power does come at a price unfortunately with the 360BT costing quite a bit more than the lower end models. If you can afford it though, we think this is probably the model most people should go for. It’s a must for anyone with over 5 acres of land who doesn’t want to go for the most expensive machines. It can cope with nearly anything you could throw at it with comparative ease and is comfortable to use for long periods. If you want to know more, take a look at our full review on the 360BT we mentioned above. 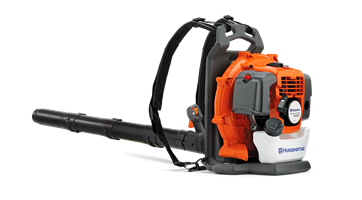 The final model in our recommended Husqvarna lineup is a blower at the top of the commercial range, the 570BTS. This is a serious blower aimed at the professional contractor and is the only model in our selection with a commercial grade air filter. This provides a 2-stage filtration system to cope with long periods working in a dusty environment. Other than that, it has the same X-Torq engine as the 360BT that has been tweaked up to 4hp. This increases the air flow rating to 768cfm and provides an increased airspeed at the nozzle of 236mph so makes quite a difference. Sound levels are higher of course at 99dB(A) and it’s a little bit heavier than all the others at 24.5lbs without fuel. Customer reviews are once again nearly positive across the board which shows how good these Husqvarna blowers are and makes our job easier in recommending them to our readers! As you would expect the 570BTS is the most expensive of our selected models although not too much more than the 360BT. This is a really powerful blower and needs some careful handling so we recommend it for use by professionals and those experienced with clearing large areas of land. 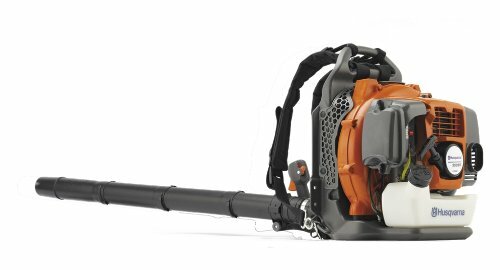 All the Husqvarna blowers we’ve looked at here come highly recommended. They are all powerful and reliable machines with good reviews, which is something we always look for when researching tools our readers will like. For the best deals on all these blowers, we recommend you check out the current prices on Amazon. They also all come with a 2-year warranty, even if used for commercial purposes which is unusual, as many manufacturers only provide a short warranty period if used commercially. There are some differences between the models in terms of the accessories that come with them but unfortunately, Husqvarna doesn't make it clear what’s included so we haven’t listed that information. 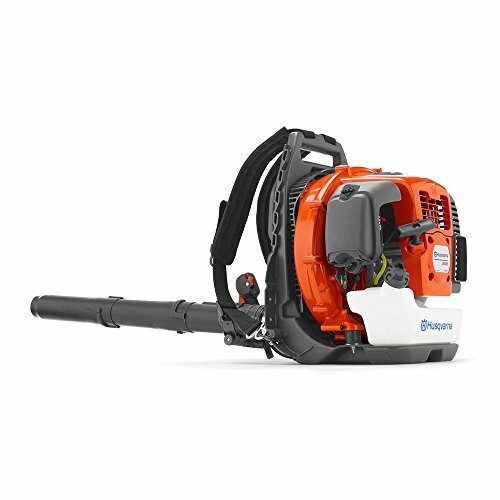 Husqvarna 130BT – lightweight but powerful, this blower is ideal for anyone with a small plot of up to around an acre, or someone who can’t manage a heavier machine. Husqvarna 150BT – entry level commercial machine that can handle most jobs on a medium sized piece of land, say between 1 and 5 acres. More powerful than the 130BT but the price difference is not that great so worth considering even if the 130BT was your first choice. Husqvarna 350BT – upgraded version of the 150BT with a more powerful CFM rating and full commercial build quality. Well worth seeking out, especially if you can find a good deal that brings it down below the price of the lower model. Husqvarna 360BT – a mid-level commercial blower that packs in a huge lift in blowing power without adding much weight over the 150BT and 350BT. Ideal for people with over 5 acres of land to clear without going over the top on price and features. Husqvarna 570BTS – one of the top level commercial machines in the Husqvarna range. Very powerful and needs careful handling so best for professionals and experienced users.